We have many videos on how to repair leaky metal roofs, including skylights, vent flashing, and metal seams. Never use tar or caulking to attempt any repairs on metal roofs. Caulking dries out and doesn’t last. When repairing leaks on metal roofs, you need to use a product that will adhere to metal, and that is flexible so that it would not crack during the expansion and contraction of the seams. Watch these videos on How we use Turbo Poly-Seal to make repairs on metal roofs and skylights that last. 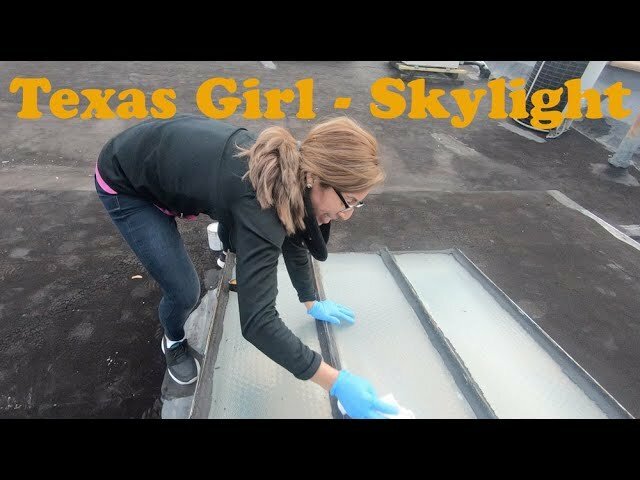 Watch this video in how to seal between the glass and metal frame of an old style skylight. 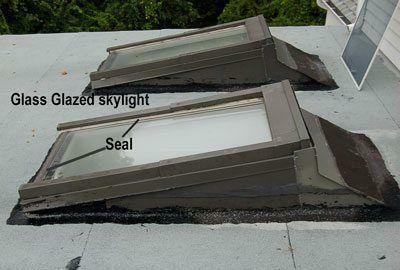 The seal between the glass and metal frame is what deteriorates and then cause the skylight to leak. Without removing the metal frame and replacing the seal we can make a transition that will never crack again. This video shows how we sealed the seams where to metal panels joint together. One of the most common issues on a flat roof is the seams where to metal panels overlap each other. What happens is that the neoprene washers dries out and loose the pressure that it suppose to have to force the two panels tight together. Water starts collecting around these fasteners and also between the overlapping panels causing the metal to corrode. What we do is to remove the fasteners and replace them with a low profile pan head screw. Then we clean the area around the overlapping seams and install Turbo Poly Seal with a mesh to create a smooth transition. 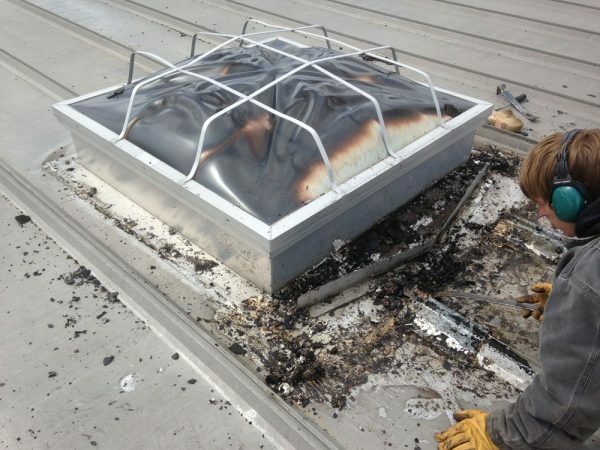 Seams on a metal roof start to leak due to the fasteners loosening up. We removed the old bolts and and replaced it with new pan head screws before we applied Turbo Poly Seal. 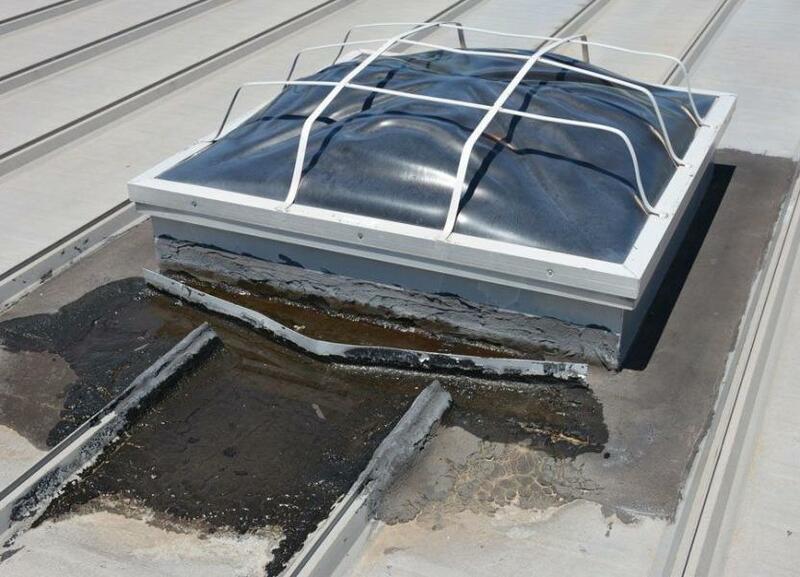 Another method to repair skylight flashing on metal roofs is to use Modified Bitumen Rubber membrane to make the transition. First we clear all the old tar and caulking from the flashing. Cleaning the flashing around a skylight on a metal roof. Fitting a rubber membrane so it overlays the panel and the skylight. The next step is to adhere the membrane to the metal surface. We use Karnak 81 or Karnak 66 trowel grade. We smear the Karnak the entire surface of where the rubber membrane will cover and then place the membrane in place. We then roll out all the air trapped to make sure the rubber membrane is fully attached to the metal. This method is very effective. The rubber membrane can move and stretch with metal panels as it expands and contracts. 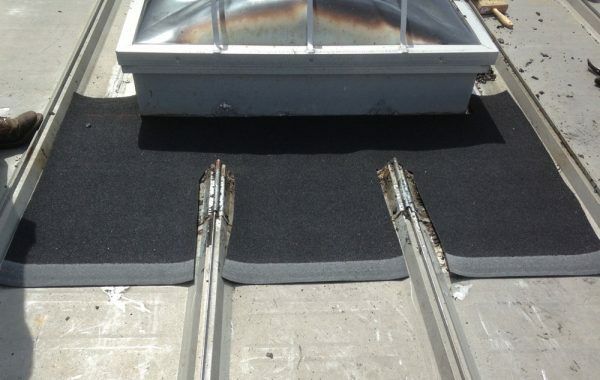 The rubber boot around vent pipes on metal roofs deteriorates and need replacement. instead of replacing it, we use Turbo Poly Seal to make the necessary repair. 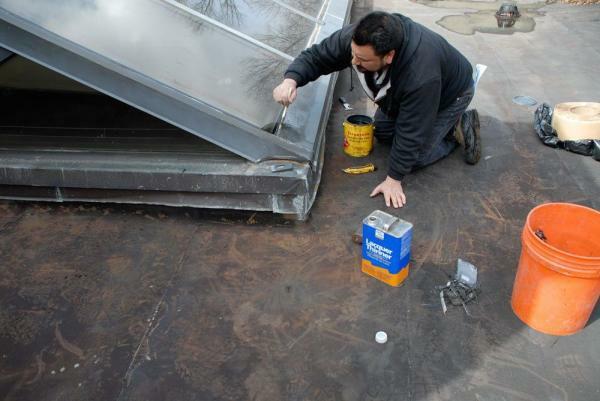 This method can be applied to any flashing or transition on metal roofs. 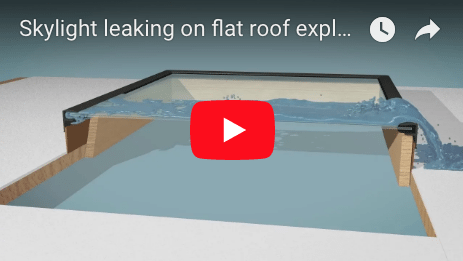 What cause a skylight to leak? 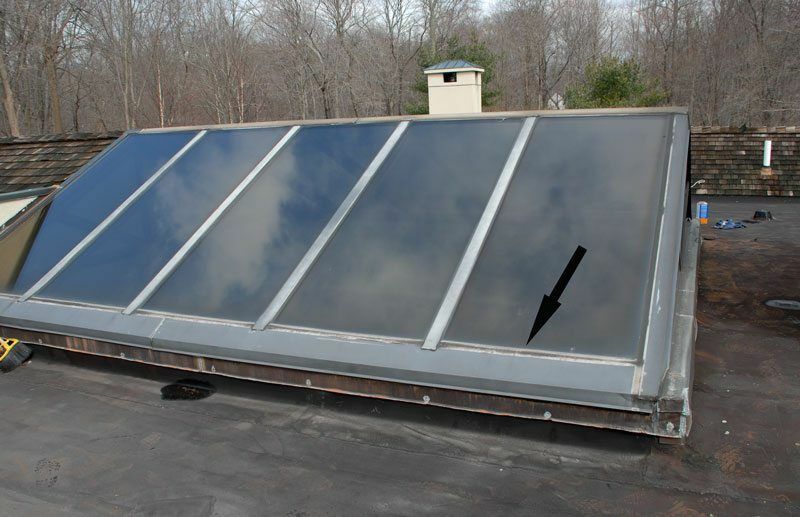 Most skylights have a metal frame that holds the glass in place. Between the metal frame and the glass is a rubber gasket. This rubber gasket shrinks and dries out. The metal frame is also not to tight and a space opens up between the frame and the rubber gasket which cause water to leak through. 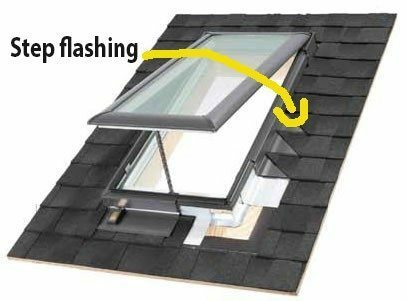 Can skylights be repaired effectively? Yes, but not with caulking. Most repairs we have seen were done with caulking and that never works. We use a product call Turbo Poly Seal to seal the transition between the frame and the glass.